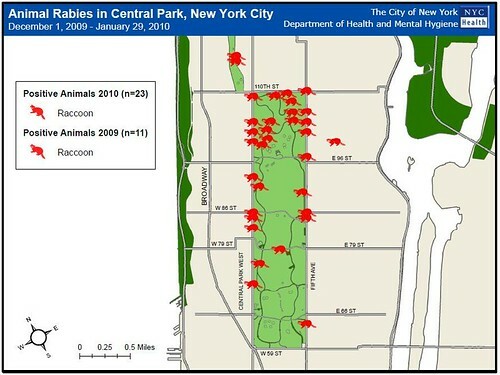 This month, 23 raccoons in and around Central Park have tested positive for rabies. In addition, 11 animals tested positive during December 2009, bringing the two-month total to 34. In contrast, from 2003-2008, only one raccoon tested positive in Manhattan. In 2008, only 19 animals tested positive for all of New York City. With the identification of three raccoons with rabies in Manhattan’s Central Park in recent months – two during the past week – the Health Department is cautioning New Yorkers to stay away from raccoons, skunks, bats, stray dogs and cats and other wild animals that can carry rabies. The recent cluster of findings suggests that rabies is being transmitted among raccoons in the park. The Health Department is increasing surveillance efforts to determine the extent of the problem. Historically, raccoons are by far the most commonly reported animal, comprising about 3/4 of reports from 1992-2008. Raccoons are nocturnal, and should be active only at night. Anyone observing a raccoon active during the daytime, or any animal that appears disoriented, placid, or aggressive, should call 311 immediately to report the location. Animal attacks should be reported to 911. Updated 2009-01-05: Added a map of Brooklyn Mulchfest locations. Bring your tree 10am-2pm Saturday, January 9th or Sunday, January 10th to one of over 80 locations citywide. Residents can also pick up free mulch at designated chipping locations. Volunteers from Sustainable Flatbush, including your host, will be helping out at the Park Circle location of Prospect Park. 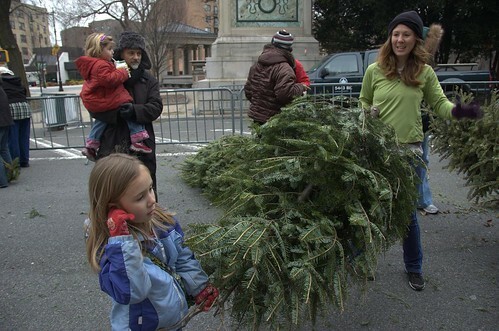 In addition, Brooklyn residents are invited to drop off their Christmas trees at Green-Wood Cemetery for mulching, daily from 8 a.m. to 4:30 p.m. and on Jan. 9, from 10 a.m. to 2 p.m. Master composters from the Brooklyn Botanic Garden will be on hand to discuss the benefits of using wood-chip mulch. Free wood chips will be available in exchange for those who bring their trees. Sponsored by the Green-Wood Cemetery and Brooklyn Botanic Garden; Green-Wood Cemetery, Fifth Avenue, at 25th Street, Greenwood Heights, Brooklyn, (718) 768-7300; free. 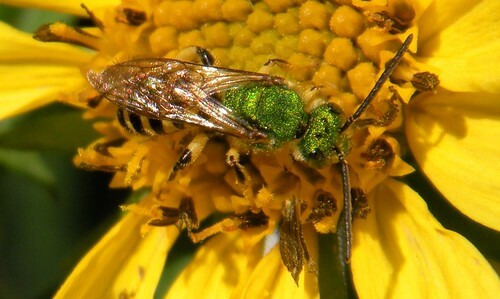 Agapostemon sp., Metallic Green Bee, Jade Bee, illustrated my guest rant on Garden Rant in 2009. Here's my review and recap of 2009. January 27: I attend my first - maybe my only - Plant-O-Rama at the Brooklyn Botanic Garden. March 4: Robert Guskind, founder of Gowanus Lounge, dies. May 2009: I attend the Chicago Spring Fling meetup of garden bloggers. July 29: The City Council approves the Flatbush Rezoning Plan, a story I've been tracking for years on this blog. There were several personal milestones and achievements, my pleasure in sharing them tempered by the absence of my father this past year, who would have been proud. February 2: I presented on Community Blogging at Historic District Council's monthly Coffee Talk series. March 12: I was a Neighborhood Association honoree at the Flatbush Development Corporation's 34th Anniversary Celebration Dinner. May 2009: This blog reaches 100,000 visitors. June 25: I'm among the community leader honorees at Brooklyn Community Board 14's Annual New Member Reception & Awards Ceremony, the first time bloggers were recognized. Fall 2009: Completed my Certificate in Horticulture from the Brooklyn Botanic Garden. The End of "Gowanus Lounge"
This morning I discovered that the domain for Gowanus Lounge had been appropriated by a commercial site. I learned this afternoon that the domain had been sold. Gowanus Lounge had been the project of founder Robert Guskind, who died (too soon) in March of 2009. Archived content from Gowanus Lounge is now available at a new, "memorial" domain, bobguskind.com. I'll be updating my links to the old Gowanus Lounge site to the new domain in his name. It saddens me to have to do this, but I must, since Bob's work is no longer available at the original domain. It's clear to me that the new proprietor of the domain expects to garner hits through links to Bob's old work. I refuse to support that.